This is where and when it all started. The CNA organized its first cleanup of Magazine Beach with partners the CRC and RBC in November 2010! We’ve come a long way since then. Earth Day Cleanup–Please remember to sign up TODAY for the Saturday, April 20th, 9-12noon, Earth Day Cleanup. This year, Starbucks is partnering with us at Magazine Beach and it’s likely that they’ll sponsor us per volunteer. So your volunteering will help us twice: once with the park cleanup and a second time with a possible corporate donation. Signing up is a 2-step process. Please persevere. We need you! 1. Register as a community volunteer at: community.starbucks.com. Meet us in front of the Riverside Boat Club on Saturday morning. 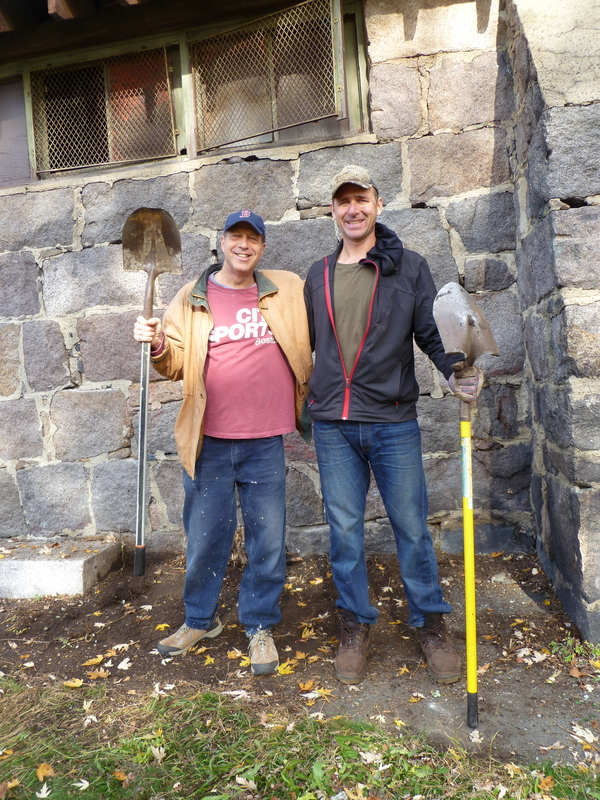 The Charles River Conservancy will provide gloves, tools and assignments. So far 15 people have volunteered to assist. We’ll need at least 5 more to qualify for Starbucks funds, so PLEASE sign-up today. HSR Presentation and Powder Magazine Open House–Coming soon: May dates for a public meeting presentation of the Historic Structure Report for our 1818 Powder Magazine, and an open house for it, too. Small Powder Magazine Exhibit at the Cambridge Public Library–A key to the powder magazine and the historic photo, “The Old Magazine,” will both be on view on the 2nd floor of the Main Library until April 15. Check it out! See CPL Archivist Alyssa Pacy’s blog posts about it here and here, too. Donations, Please–Many thanks to all who have contributed to the stabilization of this historic structure. About 100 neighbors have donated so far. We’ve raised almost $10,000 that we’re hoping DCR will match 2:1. If you haven’t made your tax-deductible contribution yet, please do. Send a check made out to “Cambridgeport Neighborhood Association, Inc.” (note: for powder magazine stabilization) to: CNA Treasurer Jay Shetterly at 127 Magazine St., Cambridge, MA 02139. We Need Contributions of Talent, Too–We are grateful for the outpouring of support to revitalize Magazine Beach. How can you help? We need assistance with grant writing, social media, graphic design, photography, editing, etc. Please let me know: Cathie Zusy, CNA Board Member, cathzusy@gmail.com or 617-868-0489. ← Lovely Party Sunday Raises $4k and Sights as Well!